Yep, that’s what we said—Banana Sweetpotato Smoothie! It uses sweetpotato puree to make a breakfast, lunch, or snack that’s super simple and satisfying. Sweetpotato puree is a cinch to make—click here for tips—but it’s also easy to have on hand. The next time you’re making any sweetpotato dish, just make a little extra. Mash up the leftover flesh and freeze one cup portions in resealable bags. When you’re ready for a smoothie, break up the puree, pop it in the blender, and go! 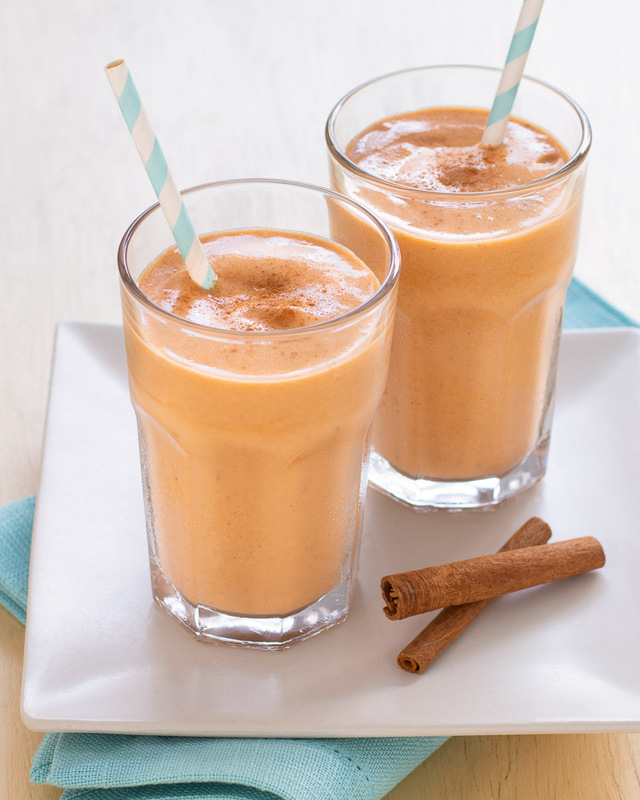 In the jar of a blender, combine the ice cubes, sweetpotato puree, banana, milk, maple syrup, and pumpkin pie spice or cinnamon and blend until smooth. Add more maple syrup to taste. Serve sprinkled with additional pumpkin pie spice or cinnamon. Notes: If you forget to freeze the banana in advance, just add more ice cubes. If you like, add a tablespoon or two of your favorite nut butter.